A 64-years-old male with medical history of hypertension, type II diabetes, coronary artery disease, and AL amyloidosis involving the heart, kidney and liver was admitted for decompensated heart failure, requiring Intra-Aortic Balloon Pump (IABP) and inotropic support. The patient was listed for heart transplant, but later developed cardiac arrest and required Veno-Arterial Extracorporeal Membrane Oxygenation (VAECMO) treatment. Abdominal X-ray was obtained to confirm the position of feeding tube which showed massive intra-peritoneal calcification (A). CT abdomen was obtained, and he was found to have extensive splenic calcification measures 8.9 x 7.1cm in cross-section and it spans 8.9 cm in craniocaudal direction (B). Spleen was impalpable on physical exam. Before the cardiac arrest, patient's renal function was at baseline, with the remaining of the basic metabolic panel normal. Hepatic function panel was significant for mild elevation in alkaline phosphatase and alanine aminotransaminases. All other laboratory work including coagulation and iron studies were normal. Nonetheless, patient's condition deteriorated over the course and he expired. Amyloid fibrils have an affinity to calcium and can result in calcific deposition in organs. Literature review showed that in amyloidosis, splenic calcification occurs in conjunction with other organs calcification especially liver. 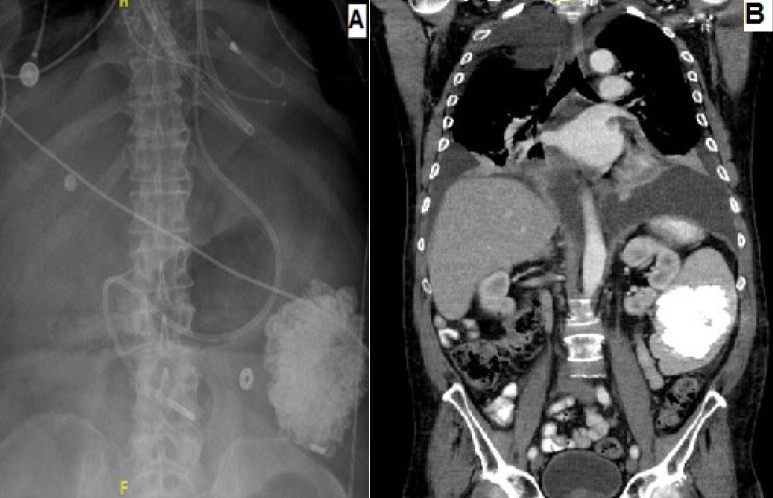 Thus this patient's case highlights the unique presentation of isolated massive splenic calcification without any other organ calcification with relatively normal laboratory and physical examination except findings consistent with his heart failure diagnosis. ©Gaurav Dhansukhlal Gheewala et al. This is an Open Access article distributed under the terms of the Creative Commons Attribution License (http://creativecommons.org/licenses/by/2.0), which permits unrestricted use, distribution, and reproduction in any medium, provided the original work is properly cited.